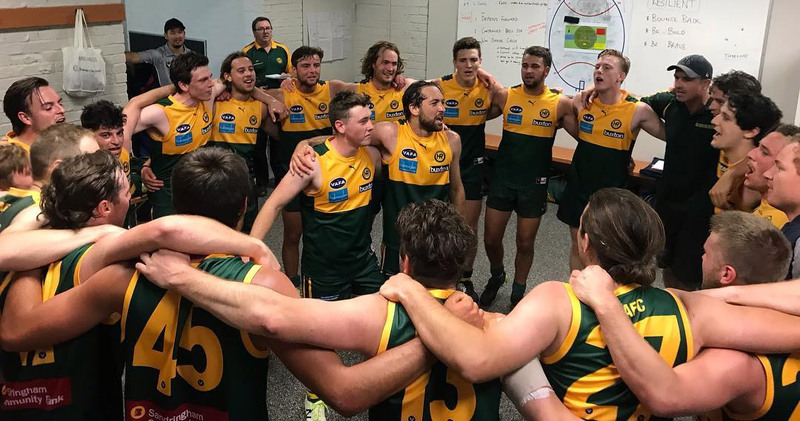 In the rematch of the 2018 Grand Final expectations of a tough match were in the air and the Rovers were keen to reverse the result from last September. The Rovers started in brilliant fashion from the first bounce. A tap out by Innes, a tap on to Naha’s, a pass to CJ, a long kick deep into the forward line and the contested ball spills free and new player Lachie Gallagher in his first Ressie game goals! Simple game really! If only it was so simple. The Rovers then had much of the play for the next 5 minutes. Huggy laid a great tackle for a second chance at goal but to no avail. Then in a blink of an eye Ormond had 2 goals from 2 forward entries to hot the lead. All against play but they took advantage of some unfortunate Rover critical turnovers. Things then settled down with both sides finding it difficult to break clear of packs. TJ was busy getting contested ball in packs while Taylor was showing some grit good reading of the lay down back. Ormond had as much of the ball but found it difficult to score due to immense pressure from the Rovers across the mids and backs. The nexus was broken when Turj broke free in another congested deep foray and goaled to give the Rovers back the lead. The lead extended by Timmons with a goal (from a lead and a great delivered pass). The icing on the cake for the quarter was Naha’s breaking clear and kicking long into the half forward where Zaina ran on to the loose ball and goaled on the run. Rovers up by 9 points at the 1st break. The 2nd quarter was a real struggle for both sides to get clear. Plenty of pressure from both sides but exemplified best by Jewell as usual. Ormond continued last year’s hard running forward when they had the ball but through the pressure they couldn’t string clean possessions together to hurt the Rovers – until the 17 minute mark when they finally broke through for the 1st goal of the quarter. When Innes went down after being accidentally tunnelled, Ormond goaled from the confusion. Unfortunately, while he was being attended to Ormond got a centre clearance and took advantage of a spare man in the forward line for their 3rd goal in 3 minutes. Soon after they then scored a 4th if 5 minutes. In the matter of 5 minutes Ormond had smashed the game open to go from 11 points down at the 17 minute mark to be 13 points up at the major break. The 3rd quarter started well for the Rovers with Lachie G bursting out of the pack to set up Naha for his 1st goal. J-Love was brilliant in the air taking several strong pack marks while Merlo was gathering plenty of possessions across the wings. Tait scored the Rovers 2nd goal from a strong mark and the Rovers suddenly trailed by a few points. Ormond finally got a goal to extend their lead but a strong pack mark by Jacko got a reply goal for the Rovers. Ormond held a slender 3 point lead at the 3rd break. Lachie G continued his impressive debut with another great tackle and then covered ground to contest and kick his second goal for the day out of the pack. Suddenly the Rovers were in front again! Well until Ormond goaled shortly after. The Rovers got their 2nd goal from a strong tackle free and hit the lead. The game see-sawed across both desperate midfields and defenders. Duck as usual crashing packs and laying heavy tackles. Ormond somehow were able to score their 2nd goal to retake the lead by 1 point. With a few minutes left, it was anyone’s game. It was a gripping last few minutes when both sides got it deep forward but desperate defence held them up. With a minute to go a long kick clear of defence by Ormond looked like they may have hung on until Dougie *B swooped on the free contested ball just short of centre and after a sprint clear wobbled one through the big sticks for a Rover goal to grab the lead again with 1 minute left on the clock! Winning the centre clearance, the Rovers held on to a memorable win! It was a memorable GF replay. Ormond continued to play an exciting (if a little risky) brand of footy with hard running forward when they get the ball out back. A few sloppy errors prevented them taking full advantage but then again there was heaps of pressure to force this. Overall, apart from the 4 goals in 5 minutes the Rovers were slightly steadier throughout the day so would have been stiff to lose despite the close finish. Well done to both teams in a high-pressure entertaining game.